Hongkong & Shanghai Hotels has celebrated the ground-breaking ceremony for The Peninsula London in Belgravia, London. 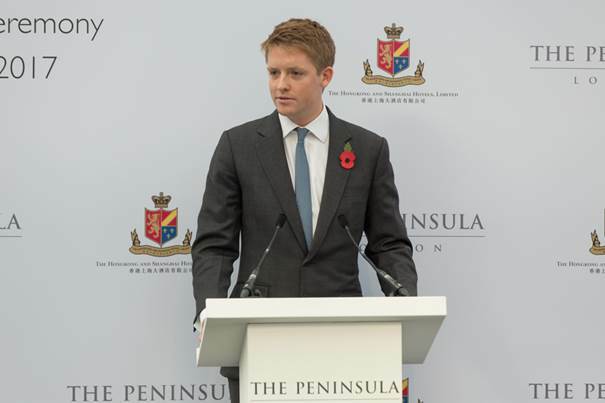 The duke of Westminster attended as guest of honour at the ceremony which was hosted by HSH chairman, Michael Kadoorie. Speaking at the event, Kadoorie said: “This is an important day for our group. “We were most pleased, after many decades of searching, to have found such a magnificent location for The Peninsula London hotel and residences. “It is our vision that The Peninsula London shall be recognised as one of the finest hotels in the world. The project site for The Peninsula London is in a spectacular location overlooking Hyde Park Corner and the Wellington Arch and will comprise a 190-room hotel and 24-28 luxury residential apartments, with opening currently scheduled for 2021. Hongkong & Shanghai Hotels managing director, Clement Kwok, added: “The Hongkong & Shanghai Hotels’ philosophy is to focus our business on a small number of hotels which are recognised as being amongst the best in the world. “We emphasise quality rather than quantity and all our hotels are situated in the most prime locations in major international gateway cities. “London is one of the world’s most dynamic and vibrant cities, with a unique energy and culture, and we believe it has a most exciting future. As part of the project, the owners will also provide affordable housing located at Buckingham Palace Road in Westminster. The project is expected to support over 2,000 jobs and deliver additional expenditure of £60 million to the London economy annually, offering a significant boost to London’s tourism industry. The Peninsula London hotel has been designed by UK-based Hopkins Architects Partnership, with the interiors designed by Peter Marino Architect.